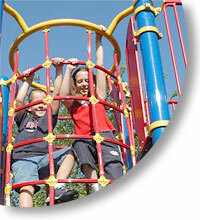 We bring your playground safety program FULL CIRCLE! The Purpose of a Safety inspection program is to provide a safe yet fun environment for children. The NRPA (National Recreation and Park Association) estimates that preventative maintenance programs can help avoid 30-40% of playground accidents. In addition, 60% of playground litigation alleges "poor maintenance" or "lack of maintenance" as the primary cause for the accident. It is clear a program for routine inspection and maintenance is essential. Each year, about 200,000 children are injured on playground equipment. About 15 will die each year as a result of an injury related to playground equipment. Most of these injuries are caused by falls to the ground below the equipment . We propose a system for ongoing inspections based on the CPSC (Consumer Product Safety Commission); ASTM (American Society for Testing and Materials) guidelines for playground safety. By providing playground audits, inspections along with full service cleaning and maintenance. WHY? Simply put, risk is an inherent element of play; so all accidents cannot be avoided...But, most accidents and injuries are caused by the existence of hazards on the playground. A consistent playground inspection and maintenance program will reduce playground hazards and injury potential.